Humans decide what they should based on their nutritional needs, beliefs and background. These choices may be political, environmental or cultural. For some dog owners, these choices carry over into the diet they choose for their pets. If you've been looking for a healthy and delicious recipe for homemade vegetarian dog treats, you've found it! Vegetarian diets for dogs are not highly recommended by many experts in the field, but they can be done. In fact, some dogs have digestive issues with meat and they require a vegetarian diet. However, if this is the diet you're choosing to feed your pet, you need to do so with the help of a veterinarian or canine nutritionist. Dogs have certain nutritional needs, and those need to be met or your Fido could suffer serious negative health effects. If the vegetarian diet is a good choice for your pup, these healthy homemade vegetarian dog treats will be a nice addition to his regular food. 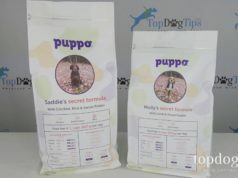 These are also a great choice for any dog owner looking for a safe and healthy snack for their canine companion. These homemade vegetarian dog treats are easy to make, and since you won't need to do any chopping (unless you use fresh parsley) the prep work only takes about 5 minutes. These canine cookies will be ready for the oven in about 10 minutes! Combine the whole wheat flour, rolled oats, nonfat dry mil, parsley and salt in a large mixing bowl. Stir the ingredients until everything is evenly mixed. Add the egg and peanut butter to the dry mixture. As I explain in my video guide above, i microwave the peanut butter for about 30 seconds before adding it to the mixture. This softens it and makes it much easier to stir. The mixture will be dry and crumbly, but don't worry. Now you'll need to add the water 1/2 a cup at a time. Add half a cup of water and stir completely. Add the other half a cup slowly. You only want to add enough water to make a cohesive dough. The dough will be sticky, but that's okay. Drop the dough in walnut-sized balls onto a well greased cookie sheet. Flatten the balls with a fork, like I show in my video, until they are about 1/4-inch thick. As I explain in my video guide, I make larger homemade vegetarian dog treats for our large breeds and smaller cookies for our small breeds. Walnut-sized balls will yield average size cookies. You'll want to cook them for about 45 minutes. If you make larger homemade vegetarian dog treats, they'll need to cook a bit longer. Smaller treats will not need to cook quite as long. This recipe usually yields about 3 dozen average sized dog treats. Of course, if you make larger treats it won't make quite as many, and if you make smaller treats it will make a few more. Next articleWhat are the Best Probiotics For Dogs and Do Our Pets Need Them?